In addition to water and shelter, having a survival food supply capable of sustaining you and your family for months or even years is the most important component of surviving a catastrophe. Although you might have plenty of non-perishable food stocked in your cellar or survival shelter, that food won't last forever and it won't supply you with certain, essential vitamins and minerals you receive from garden-grown vegetables and raising meat animals. 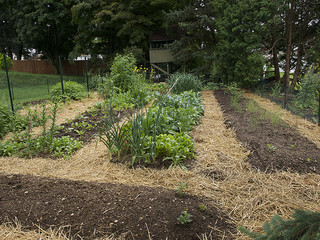 Survival gardens are more than just patches of ground in your back yard providing a few potatoes and carrots each summer. Instead, you need to consider that gardening for survival means growing enough food to sustain you and your family for several years. At least an acre is required to accomplish this type of survival food supply. Consider the climate where you intend to establish a survival garden as well as what crops do well in your area and which do not. Some crops are more tolerant to cold while others need longer growing seasons. The North American continent consists of 11 "hardiness" zones, with Zone 11 being the warmest, while Zone 1 is the coolest. Check to see in which zone you are located and select the crops most adaptable to that zone's climate. Purchase heirloom seeds to start your garden-based survival food supply. Commercial seeds will only provide hybrid, sterile plants that do not furnish useable seeds. Use non-hybrid, open-pollinated seeds that yield seeds from harvested crops each year. In addition, these seeds are more nutritional and you will avoid any possible health consequences produced by genetically altered seeds. Living on a survival homestead also provides a multitude of food choices by knowing how to forage for plants, insects, and fungi. For example, humans have consumed edible clovers such as wood sorrel for thousands of years. Also called "shamrock" clover, wood sorrel has a slightly sour, lemony taste that makes a tasty salad green and adds tang to stews and soups. As a ready survival food supply, slugs, grasshoppers, ants, mealworms, and grubs are rich sources of protein that you can eat raw or cooked. Although eating insects and other crawling creatures may seem repulsive now, just remember that a survival situation necessitates taking advantage of any available, safe food source. In addition, learn to differentiate between edible and non-edible mushrooms in your area. Mushrooms types safe for eating include morels, golden chanterelles, black trumpets, giant puffballs, and hedgehogs. You can also eat the roots and young shoots of cattails as well as the seedy tops. Take advantage of pine needles for brewing tea, birch sap to make pancake syrup and all bird eggs for a high-calorie, quick snack. Hunting and trapping game is an excellent method to extend your food supply following a disaster. Squirrel, opossum, rabbit, and various birds are just some of the animals you can trap by searching for tracks and setting snares in their living area. Eliminate any human scent on traps by sprinkling them with urine from the bladders of previously trapped animals. As part of your survival plan, purchase several applicable traps and keep them ready for use in the event of an unexpected catastrophe. Venison, or deer meat, is highly nutritious and tender if available in your area. You should package extra venison carefully and preserve it for future use by either dehydrating or canning the meat. Construct fish traps with poultry netting, or chicken wire, or other mesh material suitable for the fish species living in your area. Bait with insects, worms, or homemade doughball to catch catfish and carp, to add variety to your survival food supply. Taking the time to learn more about developing a survival food supply before a disaster occurs will dramatically increase you and your family's chances to survive for many years following any natural or man-made catastrophe.